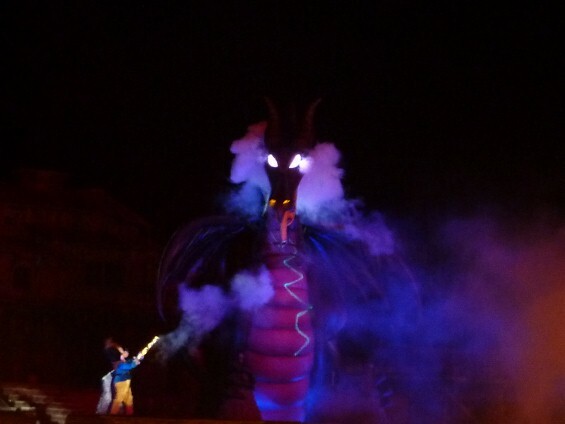 Disneyland’s Fantasmic Dragon Comes Alive! The much anticipated and highly debated event of the summer happened on Tuesday night. She finally agreed to take the stage to greet her adoring public, after months of standing them up and keeping them waiting and arguing about her return to the stage. Just who is this rising diva who thought she could keep the public at bay and ruin the entirety of Disneyland’s “Summer Nightastic” promotional campaign? 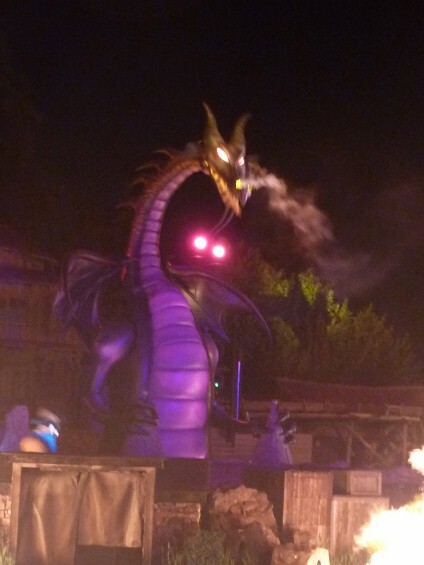 Some websites may have called her “Murphy”, but she is more famously known as the fiercesome dragon that Maleficent transforms into during Disneyland’s nighttime spectacular, Fantasmic. 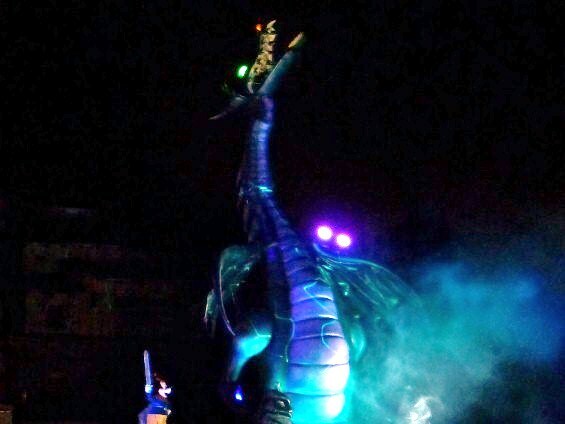 Oddly enough, when we chose to attend Tuesday’s performance of Fantasmic, I hadn’t really been paying attention to the news that people were Twittering about where “Murphy” was – I just knew that she was on her way to Disneyland and would maybe one day show up. Lord only knows that after an entire summer of being promised that she would appear, I was pretty jaded. I had even been to a talk by Garner Holt, the man whose company was creating this marvel for the folks at Disney. He opened the question and answer portion of the talk with “Don’t even ask me the obvious question…” But now, as we were seated, we began to hear a buzz in the crowd, confirmed by a Facebook message I then received. 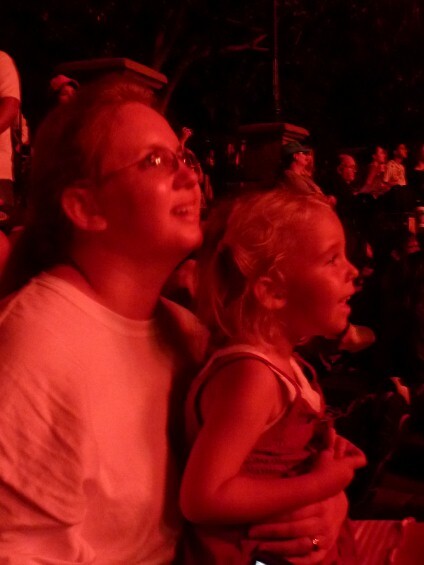 She would perform that night…..
We enjoyed the show, as it progressed. It was the first time we had seen some of the changes, including more pyrotechnics. 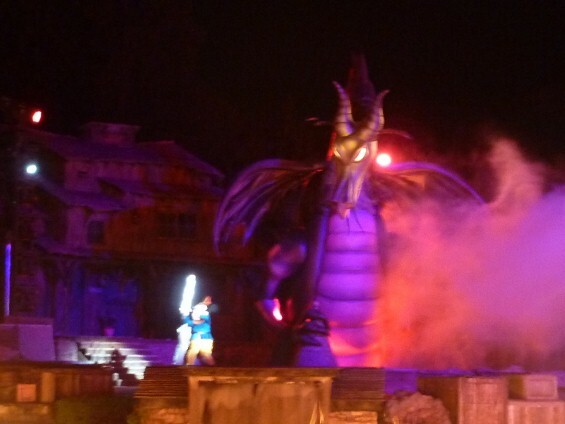 The new Flotsam and Jetsam were impressive – they were so much larger than I was expecting. In fact – they moved so quickly I couldn’t get a photo that wasn’t blurry. My husband was impressed that the speed helped to hide the method of transport – thus retaining their magical ability. Then came time for Maleficent to cast her spell. We really weren’t sure what was going to happen. 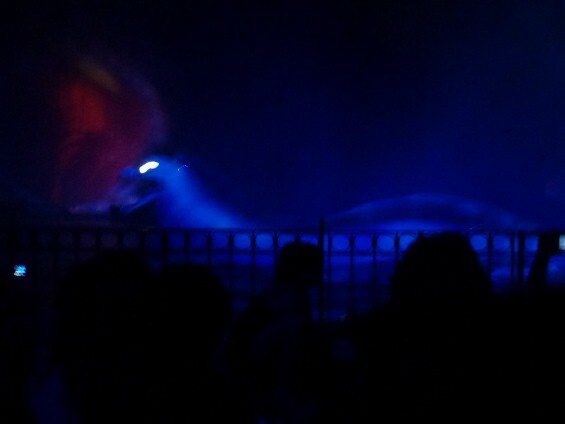 It almost looked like the usual transition, but the water screens stayed up much longer than expected. 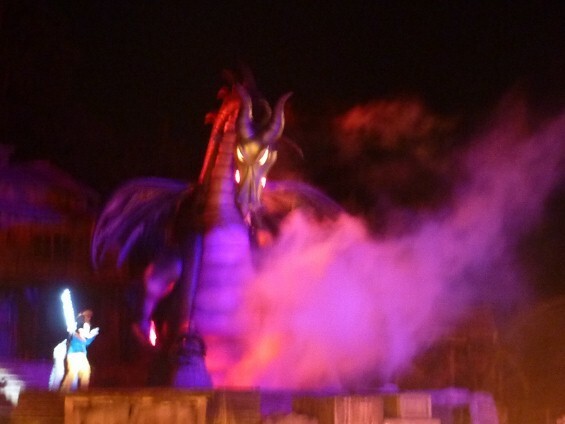 Lots of animation of the dragon transformation was projected onto the screens, it seemed to go on so long that I thought that the dragon was broken or not being used – after all, we hadn’t really seen it since March or so – when the dragon was taken out. Looking at the official press info, it takes her 35 seconds to rise up to the stage – explaining the delay. The crowd went wild! She is simply huge – and not just large puppetry – a real animatronic dragon. She stretched out to corner Mickey – and the fight began. She moved – slowly, but definitely more than I expected. The only thing she failed to do was to breathe those deadly flames at our heroic mouse, but surprisingly – no one seemed to mind! Then, as Mickey cast his fatal blow, she stretched to her full height of 45 feet in agony. 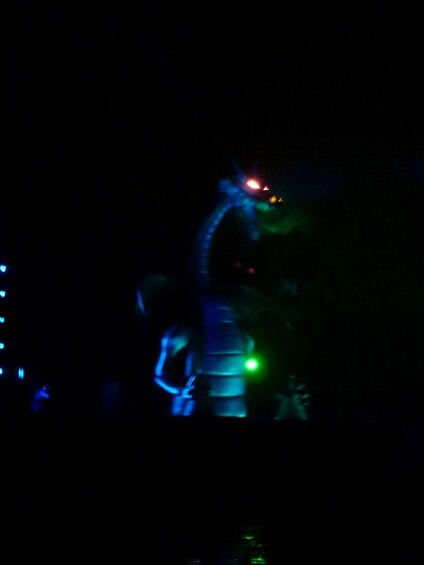 The lighting effects really help to simulate the movements and feel that the original movie dragon gives. The crowd went wild and we were all pleased with what we had seen. She was an engineering marvel. Just like the Yeti of Expedition Everest in WDW – she won’t work all the time. She may even take a vacation or two until she’s perfect. 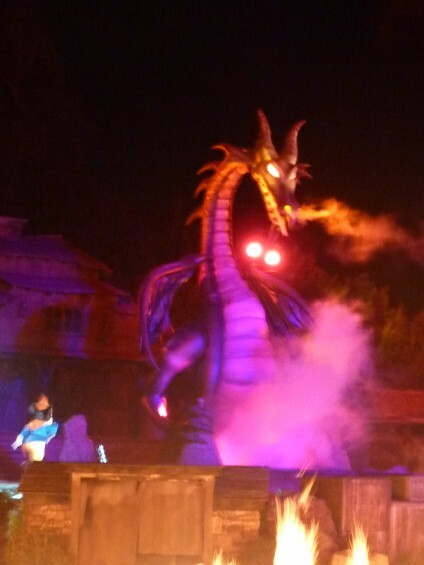 Heck, she hadn’t lived up to the hype of breathing 35 feet of fire and setting the Rivers of America in flame for 25 seconds (as shown by press photos). But you know what, in the end, she was so very real to that little 4 year old girl I took home with me and she did help us live out the fantasy of Mickey’s Imagination and the power of good over evil – and that’s all that really matters….